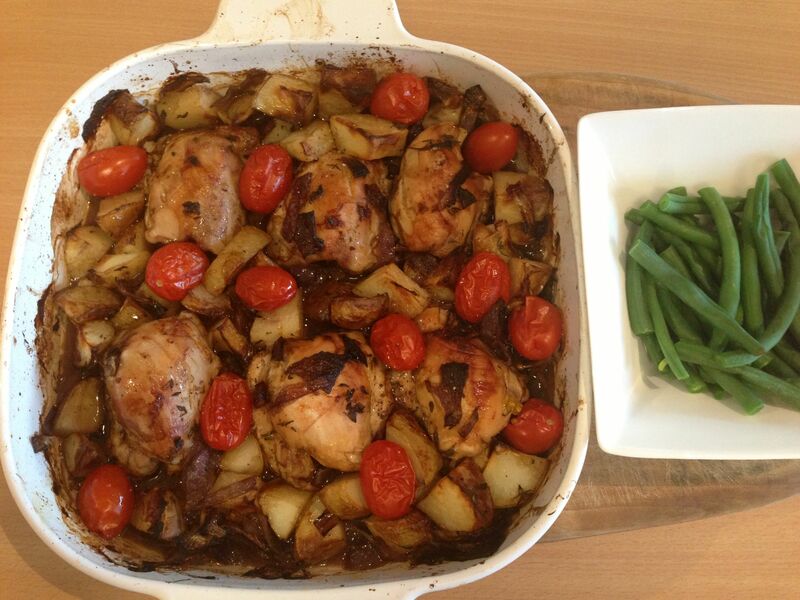 I’ve been meaning to blog about Miriam English’s Balsamic Chicken Bake for ages and I’m so pleased to have finally got around to it. Since I first tried this awesome recipe about six weeks ago we’ve eaten it many times because it’s so very easy and tasty: just put everything in the roasting dish at the same time, and then whack it in the oven. Then, just before serving, steam some greens to serve with this crowd-pleasing dinner, stick it all in the middle of the table, and that’s it – dinner is done. This versatile dinner, originally from Super Food Ideas, Issue 111, copes well with various cuts of chicken and the addition of extra roasting veggies such as carrot, pumpkin and sweet potato. Recipes like this one are so great to have in your back pocket, cause if you’re anything like me, all sorts of things need to happen while dinner is cooking: supervising the reading of school readers, quickly scrubbing the loo before guests arrive, wiping down most surfaces and putting washing away – this tasty and simple dinner enables much needed efficiency. Using the quantities below and chicken thigh cutlets, this problem- solving dish costs less than $15, serves 6-8 people, and is dairy, egg, wheat and gluten free. Pictures here are of half quantities. Preheat oven to 220 degrees celcius. 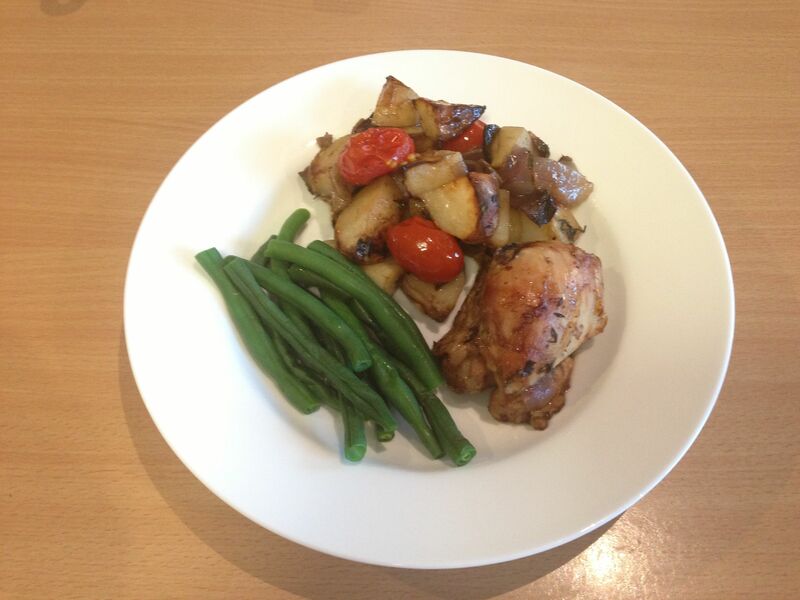 Arrange chicken, potato, onion, garlic and thyme in 2 large roasting dishes. Whisk vinegar, oil & sugar in a jug until sugar has dissolved. Drizzle over chicken mixture. Season with salt and pepper. Bake for 40 minutes. Add tomatoes. Bake for 10 minutes more, or until chicken is cooked through. Yum! This looks fantastic – and great for these colder winter days!